Marlon Richardson (right) works with students through the nonprofit. On the last day of school before the winter break recess at Howard Elementary in East Oakland, students quickly gathered their supplies into their backpacks and ran through the hallways — but one group stayed in one of the classrooms, quietly listening while huddled around two tables. 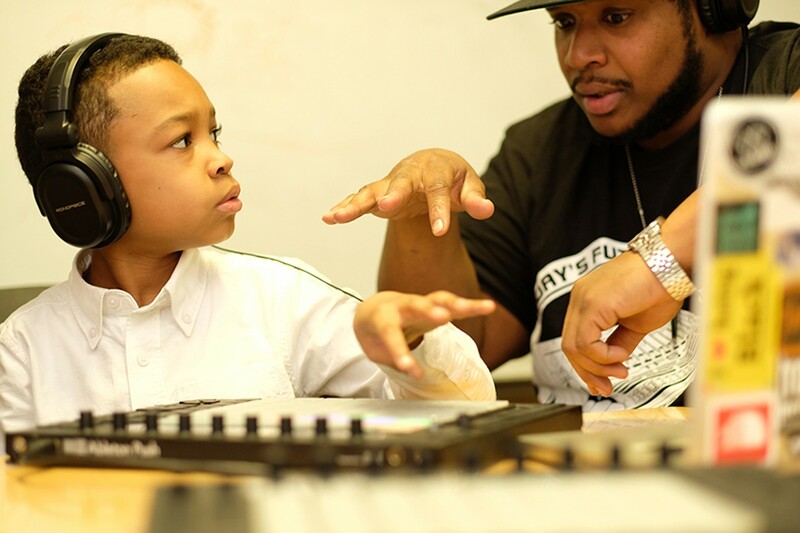 They lingered for Today's Future Sound, an Oakland nonprofit that teaches young students, incarcerated juveniles, and veterans how to make beats. It's not just a way to teach skills and discipline but acts as a form of healing and therapy, too. Elwin G. Williams III, who goes by the name of Da Rap Nerd, and Marlon Richardson, also known as Unlearn the World, are two Today's Future Sound instructors at the school as well as rappers and producers. "We show [the kids] not only how to make a beat, but also how to make a song," Williams said. "Most of the time, kids rap just to rap, wanting to express themselves. We normalize hip-hop for them." Despite the often misogynistic lyrics found in mainstream hip-hop, the genre is about community, freedom of expression, and positivity, Williams said. At that pre-winter break session, the kids were sitting close together — some with headphones over their ears, bobbing their heads to the beats; others jotting down rhymes that they'll eventually record over one of their beats. They're attentive and all smiles. Williams has been part of Today's Future Sounds for four years and an instructor with the students at Howard for three years. Producer and beat maker Ben Durazzo founded Today's Future Sound in 2010. Elliott Gann, a clinical psychotherapist, producer, beat maker, and DJ who goes by the name of Phillipdrummond, joined the nonprofit in 2012 and is currently the executive director. Now, Today's Future Sound serves over 100 schools, not just in the Bay Area but also Texas, New York, and even Australia. Roughly 80 percent of the students it works with come from lower-income minority households. In the Bay Area alone, the program serves between 3,500 and 4,000 kids, who get to participate for free. "[Gann] has found a way to make a positive impact in kids," Williams said. "It's not like the kids are goofing all day. They are actually learning what it takes to be an artist." These teachings go beyond the art of beat-making and rhymes. Williams has seen how the students take what they learn from the program into their adult lives. "We understand that not every single of these kids is going to be a rapper or a singer," Williams explained. "We are here to allow them another chance to be creative. It is a way for them to be creative without doing anything negative." Williams beams with pride when talking about what some of his former students are doing with their lives after moving on from the program. One graduated from college while another took acting classes and landed as an extra in Boots Riley's film Sorry To Bother You. He argued that the creativity and leadership and self-branding skills that the nonprofit imparts can be applied to any medium. What also makes the program stand out is its inclusivity across genders. During the last session before winter break, two girls sat attentively at the table with Williams. In this particular session, one of the girls served as the sound engineer, with the instructor telling her which keys on the laptop keyboard to press to record and save each of the students' raps. The other, sitting quietly bobbing her head as one of her other classmates raps into the microphone: "My name is Marlo, everybody know that..."
Ensuring that female students feel welcome is a crucial part of what the program is all about, particularly as the music business is heavily male-dominated. In having the girls learn alongside the boys, they all learn how to work as a team and respect one another. "We come into these schools with a trust deficit because of what most people have understood or been exposed to with regards to hip-hop music, which is mainstream and commodification of a culture," Richardson said. "This is an opportunity for us to come in and diffuse or dispel the myth surrounding [hip-hop] culture." For Richardson, it is vital to show students true hip-hop culture, which is deeply rooted in social justice. "Hip-hop pedagogy can teach kids in a way that is effective," he added. The hope is for Today's Future Sound to continue expanding worldwide while continuing to host local events, such as its monthly beat showcase and cypher called the Beat Culture. CORRECTION: The print version of this story incorrectly names the wrong instructor on the photo.